Since 2012, Promwad Innovation Company has been the official partner of Texas Instruments and a member of an international network of design centers which develop electronics based on components and semiconductor IT solutions. Over the past years, Promwad engineers have implemented a number of projects based on microprocessors by Texas Instruments. In our developments, we use processors of such families as the OMAP, the Sitara, the DaVinci and the KeyStone. 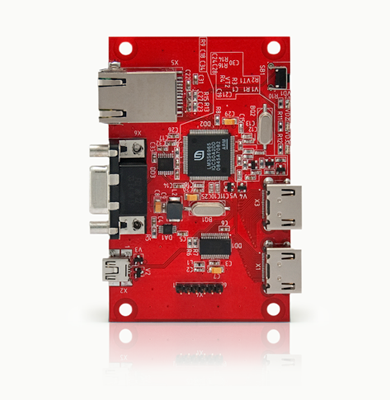 The OMAP 3530 SoC is based on the ARM Cortex-A8 kernel operating at frequencies of up to 720 MHz, and it supports a set of ARMv7 and NEON SIMD instructions. The chip also includes the digital signal processor TMS320C64X+ operating at 520 MHz, and the graphics accelerator PowerVR SGX530. The chip is manufactured using the 65 nm technology and supplied in FCBGA enclosures. In 2010, Texas Instruments introduced a new processor, the OMAP4430, which is based on the dual-core ARM Cortex-A9 MPCore SMP combined with the GPU PowerVR SGX540 (supports OpenGL ES v2.0, OpenGL ES v1.1, OpenVG v1.1 and EGL v1 .3). The processor cores operate at 1 GHz and the whole system is capable of encoding and decoding of 1080p HD video at 30 frames per second. The processor is manufactured using the 45nm technology. The Sitara family includes high-performance ARM microprocessors which combine the performance of the ARM9 and the ARM Cortex-A8 with a speed ranging from 200 MHz to over 1 GHz. This family of microprocessors features a unique combination of peripherals and hardware accelerators, which helps reduce the cost of the system and expand its communication capabilities. The AM3517 is a high-performance microprocessor based on the ARM Cortex-A8 operating at frequencies of up to 600 MHz. This SoC also includes the SGX530 3D graphic accelerator and a large number of peripherals, which helps create solutions in areas such as industrial automation, electronic service stations, digital identification, portable input / output terminals and single-board computers. The DaVinci family includes digital signal processors by Texas Instruments for building multimedia systems. They have high-performance cores and a developed periphery, which helps perform a wide range of tasks related to video and audio processing. The DaVinci DM37x video processors by Texas Instruments can be used to create new multimedia and portable devices. The DM3730 and the DM3725 feature the ARM Cortex-A8 and C64x+ DSP cores, a video accelerator (IVA), a 3D graphics accelerator and high-performance peripherals (USB 2.0, SD / MMC) integrated on a single chip, which makes them suitable for applications requiring the processing of HD video or a large amount of data. These processors can be used in navigation devices, media players, patient monitoring devices, industrial control and measurement equipment, industrial video analytics and mobile communications. The DM37x processors are software compatible with the OMAP35x processors and are pin compatible with the Sitara AM37x processors, which makes it easy to switch the existing product to a more efficient processor version. The difference between the DM3730 and the DM3725 is that the DM3725 does not have a 3D graphics accelerator. Compared to the OMAP3530, the DM3730 delivers a 50 per cent increase in ARM core performance, a 40 per cent increase in DSP performance and doubled graphics performance, as well as uses about 40 per cent less energy. The C64x+ DSP and the hardware video accelerator enable HD 720p audio and video encoding and decoding regardless of the ARM processor. 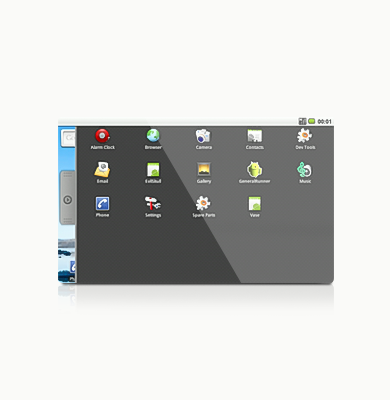 This helps run additional high-level applications on the ARM processor, including a 2D or 3D responsive graphical user interface needed for applications such as industrial tablet computers. The DSP core is programmable, allowing for signal processing tasks such as digital filtering, mathematical calculations, as well as image processing and analysis. For example, on devices with a camera, DSP can execute an algorithm for detecting the boundaries of moving objects in video images from the camera, to detect people or other objects. The TMS320DM8148 DaVinci helps process a 1080p60 video stream, three simultaneous 720p30 video streams or multiple lower resolution streams. This processor is ideal for use in power-sensitive consumer and medical video devices that require smaller streams. Such devices include skype cameras, interactive digital signage systems, digital video recorders and IP video surveillance cameras, streaming media players and network projectors. The TMS320DM6467T DaVinci video processor (1 GHz) by Texas Instruments performs H.264 video encoding/decoding with a resolution of 1080p at 60 frames per second. It is based on the ARM926EJ-S core, which supports a set of ARMv5TEJ instructions and the high-performance TMS320C64x+ core. The KeyStone multicore architecture is a platform for truly innovative developments, offering developers a number of multi-core processors with high performance and low power consumption. The TMS320C66x family of DSP processors is built on the KeyStone architecture. It is optimized for use in resource-intensive applications such as wireless base stations (as a SDR platform), automation, medical imaging and high performance computing. Do you need custom electronics development based on Texas Instruments processors? Contact us! We are ready to answer your questions.